This spring the pre-service teachers in my integrated methods: Language Arts and Social Studies were given an opportunity to work with children in the community. This was an unexpected opportunity, thanks to Dr. Lindsay Hollingsworth who invited my class into the collaborative effort. Family Connections is an organization in Platteville that provides opportunities for parents in Southwest Wisconsin. My students were invited to provide educational activities for a themed event the day before Valentine’s day, Chocolate Night. Methods courses are great, but students need more hands on learning. In class students brainstormed appropriate experiences given the environment. Being that I didn’t entirely know the variables, students had to prepare more thoroughly. For example, students did not know how many students would attending, nor did they know the ages of the children. This information caused us to consider how we might plan for groups of two or seven ages ranging from three to nine. Because I required students to create stations that tied to ELA/Social Studies in some way, students really had to focus on having projects with differentiation. This process was a challenge because they didn’t know numbers, age groups, or the environment. What a great experience in thinking on one’s feet, right? The groups did well. More than one group had to adjust on the fly. One group was had to merge with another. A second group had to adjust expectations. I was really proud of their willingness to think everything through. Additionally, I was impressed with the time commitment. The students gave up their Friday night from 5pm-8:30pm. What a long night! Their dedication spoke volumes to me about their willingness to improve their craft and gain experience teaching. Can Craigslist be a Teaching Tool? YES. It’s always a good feeling when students are able to easily critique bad writing, especially online. Folks say that these young whipper snappers can’t write or read a darn thing because of all these computer gadgets they’re playin’ with. To some degree I agree, but I know they can cut through the digital mess with guidance. As a society we are completely over-stimmed with information. Research has proven that our mind trims off excess information as a means of preservation. Hence, we miss typos. Plus, there’s no doubt, we read less now than 50 years ago. As a teacher, I’ve noticed that students who read non-fiction or informational texts, are almost always better writers. Those that don’t read, make oodles of mistakes. Really, we all make mistakes. I’m no grammar elitist, that’s for sure. Still, there has to be value in a carefully crafted sales message, even if it is just for Craigslist. I asked my students to critique a few Craigslists ads against the AIDA format. Boy, did that open their eyes! It’s such a simple format, but very few ads on Craigslists follow a model. Here are a few samples they thought provided poor examples of the AIDA format. Teaching has always been rewarding, but I have to admit that my current teaching opportunity is the most inspiring. The inspiration doesn’t come from the material or my teaching; it’s from working with the students. My students come to campus wearing many hats. Very few of them are just students. Most are working parents or returning adults looking for a new career. When they leave my class they head to work or school to pick up their children. It is inspiring seeing people push themselves to live better. This semester is no different. One of my students, Crystal, was due with a baby right in the middle of the semester. When she gave birth we were just starting a project exploring digital communication tools used in business or the home. I assigned her to understand how she could use Pinterest for professional gain or how businesses use that tool today. It was important to me to prepare for Crystal’s absence, but yet allow her the time to spend with her new baby, so I had to think of a digital conferencing tool. I decided to experiment with Google Hangouts. I’ve participated in them before, so I wasn’t nervous, but I’ve never initiated one. Plus, Crystal was scheduled to give her presentation on Pinterest on the first day. How could she present a power point and web tool from her location?! Class started with me starting the hangout and Crystal joined shortly thereafter. The class in the room was very curious to see Crystal and her new baby. As you can see, they are both very happy. We quickly learned how to activate the microphone and use the chatroom. Crystal presented first. I didn’t know if I could somehow give her control of the hangout, so I had her email me her power point. I advanced the slides when she told me. I’m certain that’s the hard way to do it, but it worked for that moment. Crystal handled the presentation just fine, as if she were right in front of us. She rolled through every hurdle with no problem, all while holding her son. When she was finished, we left the cam on so she could watch her classmates’ presentations. I still have to learn an easier way to share the desktop. I had to share it every time the presenter needed to toggle between programs like Power Point and Chrome. Again, I’m sure there’s a way around that. My class is Crystal’s only class on Friday, so I’ve decided to run a Google Hangout for her every Friday until she wants to return. She still attends our other block earlier in the week, but on Friday, she would have to drop her little man off with a sitter for just my class. I figure if we can get through a day of presentations using Hangout, then we can do anything virtually. It helps her take care of her child and still remain in the class. I am able to distribute handouts to her via Blackboard or even in Google Hangout. She can ask her classmates questions and she can even team up on assignments using Googledocs. I like knowing that there are free tools out there to help our students further their education, regardless of how many hats they’re wearing. If you haven’t played with Google Hangout, you should. It’s awesome. Establishing a Connection: I want to be sure I know all their names, their hometowns, and their programs. I don’t care if I have 70 or 150 students. I can do that. I want them to know that they aren’t just a seat. They matter to me; They matter to our campus and all of Southwest Wisconsin. I want them to really know that. Understanding What is Important: Not all my students are driven by grades. I want to understand what drives them to be in school. Understanding their drive will help me tailor class to their motivations. It also helps me establish empathy. Seeking Additional Resources: When I can connect students to additional resources or alternative experiences, they see a greater relevance. Some times that means simply showing them typos they might see in the real world or it might be something more impacting like connecting them to service organizations the match their program. I’ve always been a big believer in promoting a student-centered classroom. I’ve slipped a few times this semester with today being one of them. I have yet another fabulous Oral Interpersonal class, but this time the class is almost twice as large. That makes it challenging to have the intimate discussions that I’m looking for in an Oral Interpersonal class, but this group of students has just enough leaders to produce a really interesting environment. Today we were talking about the perception process. I was going through my usual rattle, explaining the steps in my goofy way. Students chimed in with stories. In the end, I felt okay about it, but as I started reflecting, I quickly became angry with myself. I started thinking about who did most of the talking. Me. Sure, in the beginning of a course that’s understandable, but we are in week three and these students have wonderful stories to share. Tonight I’m counting the number of student experiences I heard today and I am not counting enough. I have great students that will talk. Some even have side conversations about our discussion topics. I need to work harder to listen to them and stay out of the center. I’m not that type of teacher. I recently took my daughter to the Rollo Jamison Museum in Platteville, Wisconsin. She attended a field trip there last week where she learned about the local history and German holiday customs. I’m always curious about local history, so I brought Jenna back for a more in-depth exploration. Upon entering Saturday morning, we were greeted by a friendly fella. I explained that we already saw the Christmas portion, but that I wanted to look at the whole Jamison collection with Jenna. With a big smile he said, “Oh yes, let me show you where to start!” And he trotted towards elevator where we traveled up one story. He was completely excited to turn the lights on for us. I wonder when the last guests were upstairs. Even though he had guests down stairs, he couldn’t help but tell us a few neat facts before we began our self-guided tour. I get the feeling that Rollo Jamison was seen as a hoarder back then. His interest in collecting history started as a child with Indian spearheads. The museum is excellent and gave us a clear picture on what pioneer life would be like in Southwest Wisconsin. Even though I paid once to get in, I’ll be back and I’ll be happy to pay again. It’s well worth the money. Something that caught my eye was all the technology artifacts. I found it ironic that I was taking pictures of these items with my smartphone. With my phone I can do, to some degree, what all of these devices can do together. Still, I have great respect for these treasures as without their discovery life would be very different today. 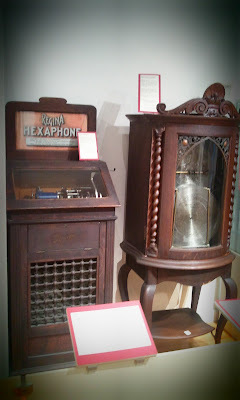 Regina Hexaphone (on the left) in 1909 would be a known as a Jukebox today. The hot must-haves started shipping back in 1909. The player on the left contains musical cylinders that allowed the user to select from six songs. Competitor models only allowed for one song selection. The machine on the right is also a Regina, but operates on a large disk instead. You can’t find these on eBay — they’re just that rare. I was able to find the crank handle for $99 dollars. Could you imagine having this big beast in your parlor so you could listen to the same six songs? 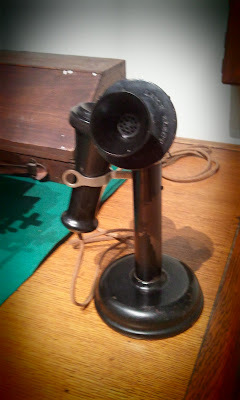 Check out this telephone. I’m guessing the other end of this phone merely went to an operator where you would ask to be connected somewhere else. I wonder what apps this comes with. When I was very little I remember my mother having a typewriter like this, but I don’t know that she used it. I think it was more for decoration, although I remember it having the ribbon. Let me tell you, this machine was no laptop as it weighed around 30lbs. If you ever want to learn about the history of typewriters, here is an interesting resource. There were a few different types on display, but this one reminded me of the boat anchor my mother had when I was a kid. I bet the battery life on this machine is better than mine, but I am guessing the spellcheck is a drag. I type my next observations with hesitation because I’m still processing my thoughts. 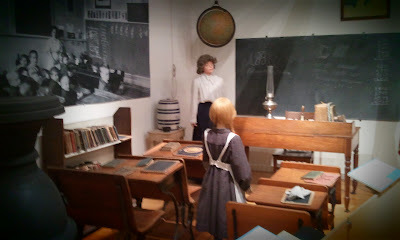 The classroom of the early 1900’s actually looks somewhat the same. The students are in rows, facing the font. The teacher is standing in front having just finished putting knowledge on the board. This scene is missing a SMARTboard and some laptops, but many teachers still use them in the same way that our pioneers would use chalk. Please don’t take offense. I’m examining our use of those devices and thinking about how thy can transform education to create authentic learning experiences. As I stood there photographing the scene, I thought, “Well…um…this one hasn’t changed much.” Of course, this is a generalized statement and surely there are oodles of examples showing otherwise. I’m thankful for those classrooms. I’m not saying this model is always bad, but no one can deny that the students walking into the classroom have most certainly changed. The method of instruction and classroom management certainly should evolve as well. I’ve always appreciated my meager beginnings. Growing up in poverty taught me how to stretch a dollar, enjoy thriftiness, and live without. I’ve never thought that I had it the worst of my friends, nor did I think that the world owed me anything. Matter of fact, I knew which classmates had less and struggled even more. In talking with a student this week I was reminded that we need to practice awareness of the hardships all around us. Most of us, myself included, live far above our means and that facade makes us blind to the poverty around us. For example, I have had moments where I am upset because I work two jobs, have two degrees, and yet I struggle financially. If a younger version of myself could give me advice, I’m sure she’d tell me to think about living with less and remembering where I came from. Listening to my student really shed light on where some of my students come from. They’re not all college freshmen living in the dorms. Actually, that would be the minority of my students. Most of my students are returning to school to further their education after working in other careers. Many have other obligations, whether that be family members or work. Some of my students are working near-full time jobs and still somehow going to school full time. I was thankful for the conversation today. Since I’m new to this part of Wisconsin, I really appreciate moments to learn about my students. Today was a really good day and it’s been great to reflect.